Why Choose T-Bars? Aluminum, Steel or Brass? What’s the value of a T-Bar? The answer is simple: load bearing! T-Bars are some of the best options for structural and load bearing applications. The top portion of the T (flange) bears the weight and resists compressive stresses, while the bottom (web) resists shear stresses and prevents the flange from bending or buckling. Furthermore, T-Bars require less material than tubes, which generally makes them a cheaper and lighter alternatives to tubes. Lastly, because you can see all of the underside of the flange as well as the web, it’s easier to monitor T-Bars for any cracks, rust, or other wear and tear. These attributes make this material popular in construction, especially for buildings, bridges, freeway overpasses, and ships. Do you need a material that will hold a lot of weight and not break the bank? Then T-Bars are probably the choice for you! This brings us to our next question, what sort of metal should you use for your T-Bar? Aluminum, Stainless Steel, or Brass? While all three are excellent and extremely versatile metals, there are certainly certain jobs that are better suited for one material over the other. Your application will dictate which alloy you should choose. The third most common element in the Earth’s crust, aluminum is a popular choice in everything from eating utensils to aerospace, and with good reason. It is not as strong as steel, but it only weighs 30% of what steel does, and 35% of what copper does. Aluminum is also naturally corrosion resistant, when it is exposed to air, it oxidizes and creates a thin protective skin which prevents further oxidation or rusting. Aluminum conducts heat and electricity much better than steel, making it useful for heat sinks or as conductors. It is also cheaper than stainless steel and is completely recyclable. It is easily machined, malleable, and accepts a variety of surface finishes. Also, the strength of aluminum increases at subzero temperatures without decreasing ductility. There are some downsides to aluminum though. As mentioned before, it is less strong than steel. It can be welded, but often it is difficult, and that is largely because aluminum has a much lower melting point and starts to become soft above 400 degrees. 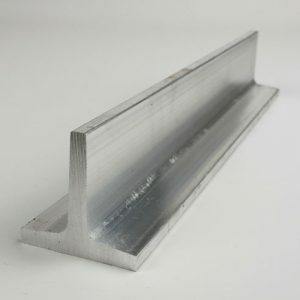 If lighter weight, corrosion resistance, lowest cost, and ease of machining, are major concerns, you should consider aluminum. Stainless steel, like mild steel, is predominantly iron and carbon, but it is the addition of chromium that makes it “stainless.” Stainless steel is very strong, but also more brittle than mild steel or aluminum as a result. It is very corrosion resistant, though “stainless” is a bit of a misnomer, as it will discolor or rust eventually. Stainless is non-magnetic, and has very poor electrical conductivity, which is a benefit or liability depending on your usage. It is also extremely easy to weld, though harder to machine as it is more brittle. Lastly, stainless tends to be more expensive than aluminum. If your job requires high strength and corrosion resistance, needs to be welded, and weight is less of a concern, then stainless is the metal for you. Predominantly copper, with zinc added for hardness, brass is an extremely popular choice in metals, particularly when appearance is crucial. It has a pleasant golden color, and resists corrosion well. It is also easier to machine than stainless steel, and can be soldered easily, though welding is not recommended. This alloy of brass has a high melting point, about 1,600 F, as well as being electrically conductive. This alloy of brass also has a high strength and weight that is comparable to stainless steel. It is also slightly cheaper than stainless in general. If high strength and corrosion resistance are your biggest concerns, but you want a more dramatic visual appearance than steel, brass is what you should be looking at. We hope that this little guide helps answer questions and narrow down what you want to use. Happy building from OnlineMetals!